Adorable ce petit ensemble. J’ai déjà cousu la blouse et je pense que je vais me lancer dans la veste aussi. Le tissu à cerises est magnifique! Franchement, lance-toi, elle est vraiment agréable à coudre (si l’on excepte les longues lignes de matelassage, zzzzzzzz…) et je trouve le résultat très gratifiant! Very adorable! Hopefully her parents get a lot of pictures of her in it! I had some very cute outfits made for me as a child, and I love looking at pictures of me wearing those clothes since I can’t wear them anymore! 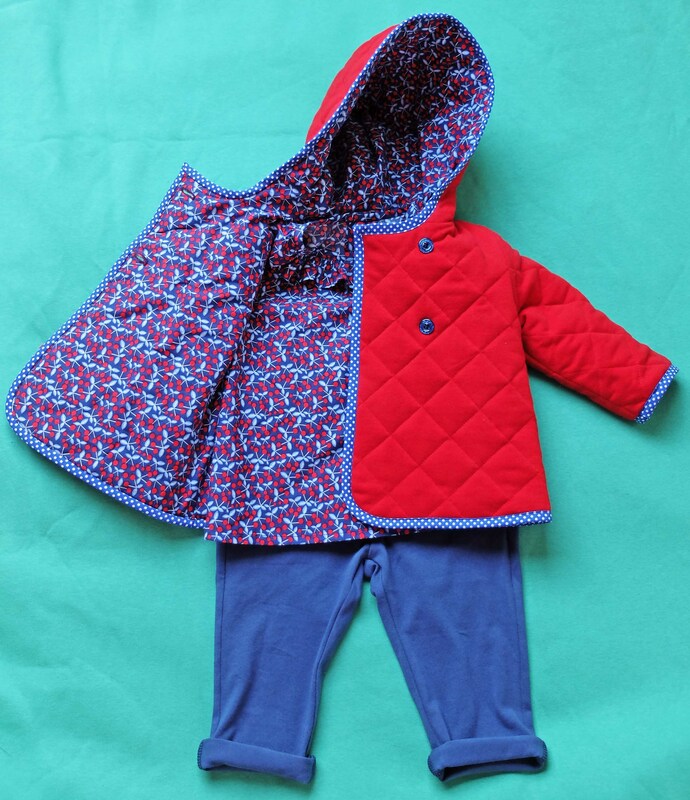 I especially like the quilted jacket! I will have to keep the pattern in mind when friends/family start having children! Thank you! 🙂 That’s exactly what her mother told me when she discovered the outfit: that she was going to take lots of pictures of her in it! Oh my goodness. 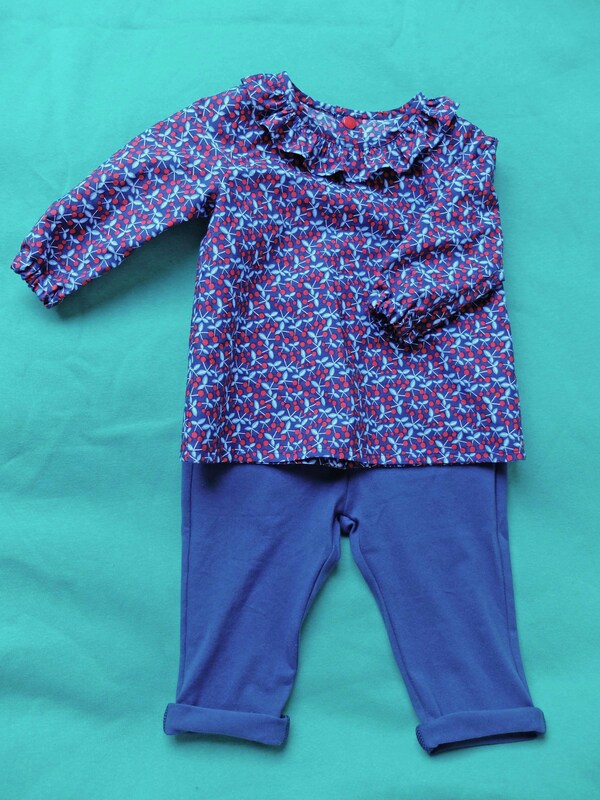 This outfit is sooooo adorable!! coudre pour les autres permet de nouvelles expériences, des tissus et des coupes differentes.c’est super. This is simply gorgeous! I’m not a very good unselfish sewist either, but I always kick myself when I do make something. 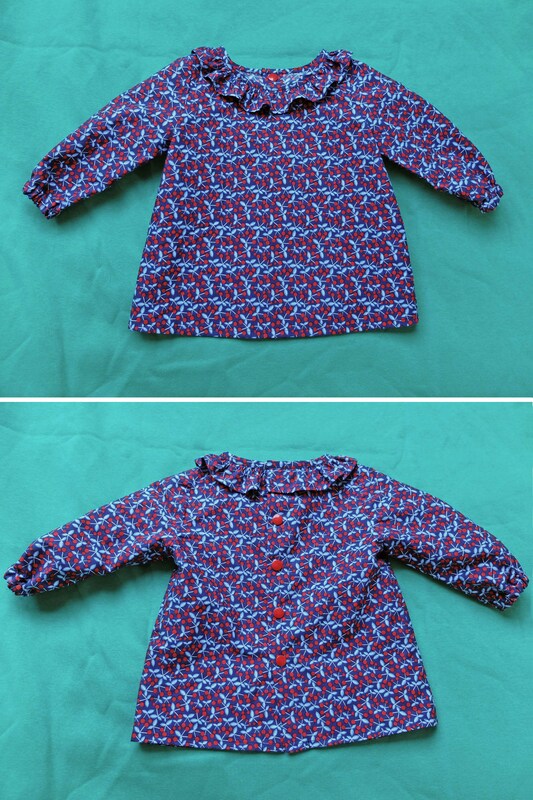 It’s actually super quick to sew a dress for a little girl. 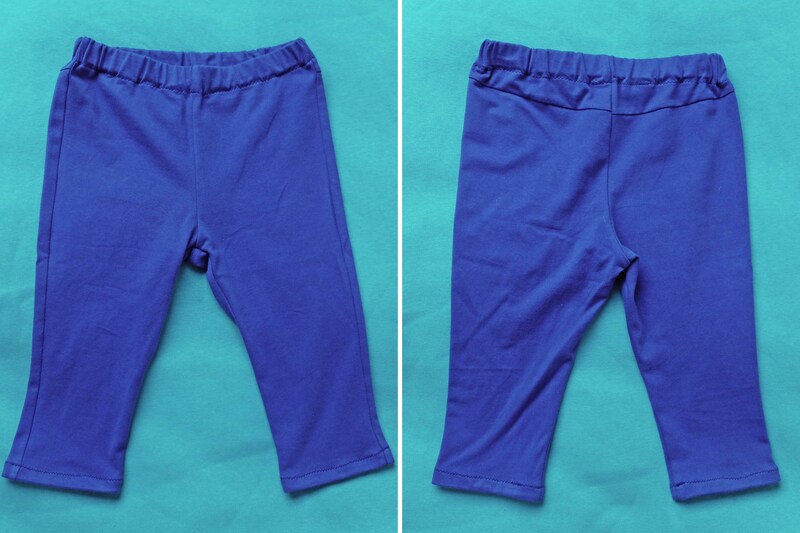 Short seams and little to no fitting. Win! 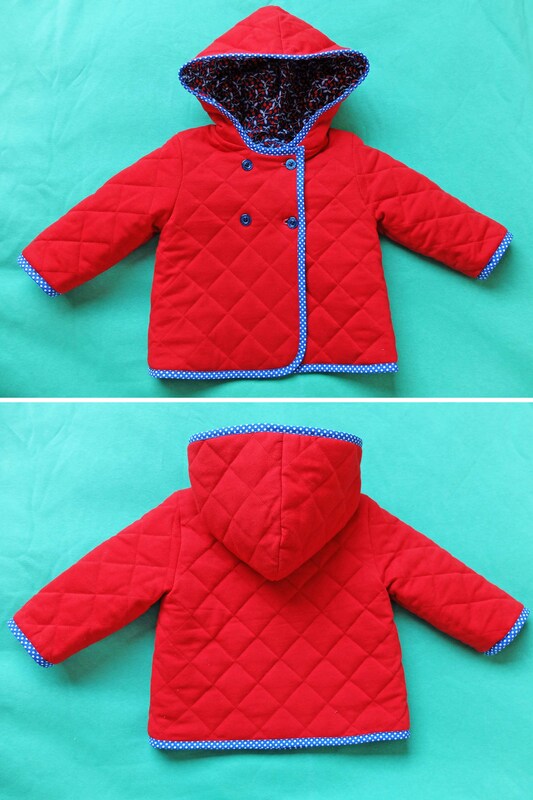 Well, the jacket was not that fast to sew because of the quilting, but other than that sewing for babies is indeed super quick, and you’re so right about the (no) fitting part, way less pressure than for grown ups! This is such an adorable outfit and looks beautifully executed. 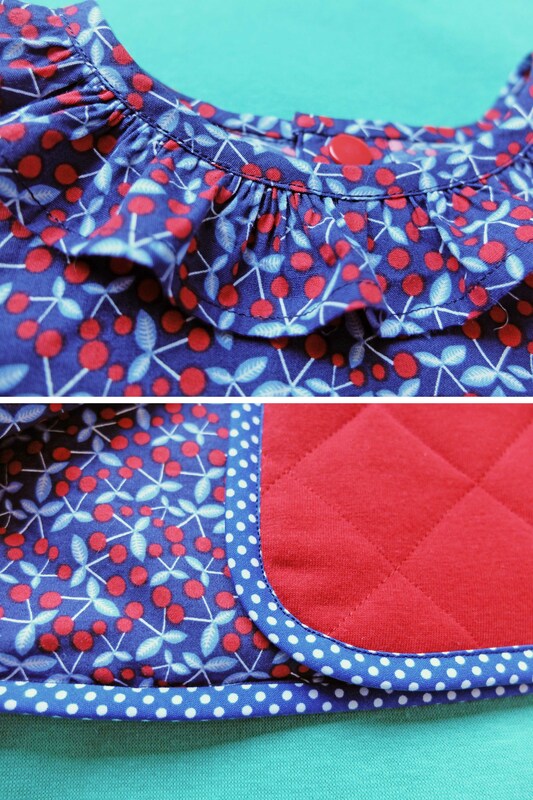 I especially love the polka dot bias binding. I’m guessing you bought the PDF version? I used the magazine version so the instructions were easy to find… They should also be easy to find in the PDF version though, so if I were you I’d email someone at BurdaStyle to make sure they didn’t omit the instructions in your version by mistake!